"Stronger Together," a Broadway fundraiser for Hillary Clinton's campaign, took place in New York City on Monday evening. 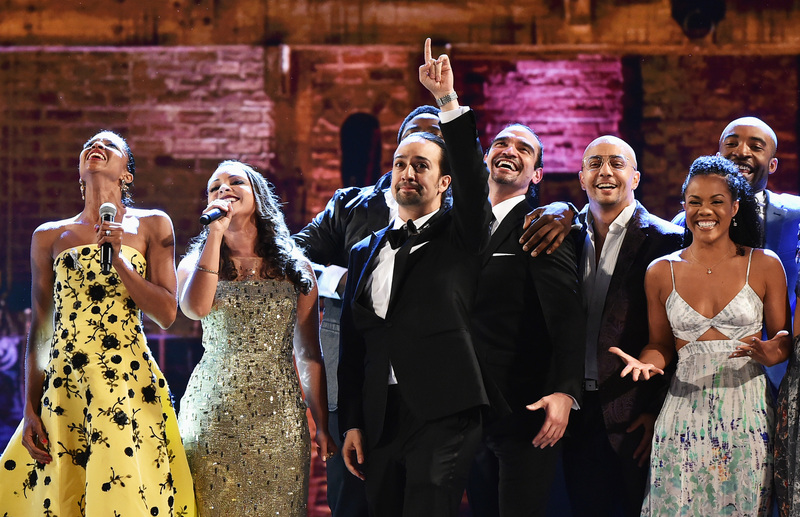 And everyone knows the star-studded event wouldn't have ever been complete unless Hamilton's Renée Elise Goldsberry and Lin-Manuel Miranda rapped about Clinton in true Broadway fashion. The pair performed a rewrite of the hit Broadway musical's "The World Was Wide Enough" and if you loved the original version, you'll like this one even more. If you have your doubts, just wait until you hear Miranda rap "Tim Kaine in the membrane." The event, hosted by Billy Crystal, featured over a dozen performances and more than 10 monologues and speeches from big names such as Lena Dunham, Angela Bassett, Helen Mirren, Julia Roberts, Sarah Paulson, and even Chelsea Clinton. Some other musical performances included songs from productions such as Into the Woods and Annie, among many others. The event aired at 8:30 p.m. ET and was available via livestream from a number of different outlets, including Clinton's own YouTube page, and several social media platforms. This isn't the first time many of these performers, including Miranda, have taken the stage to show support for the nation's Democratic presidential candidate, but it was arguably the most star-studded campaign fundraising events yet. "Tim Kaine in the membrane, Tim Kaine in the brain!" Miranda belts out. "I have only one overwhelming feeling," Miranda sings. "Anybody here want to shatter a glass ceiling?" both he and Goldsberry exuberantly ask the crowd. Whether or not you're a fan of the 2016 Democratic nominee, Clinton did, in fact, make U.S. history when she became the first woman to accept a major party's presidential nomination. If her support system among the public is anything like it is within the Broadway community, it looks as though she has a good chance of breaking it even further come this November.